On the 10th June 2017 we catered for the wedding of Pat and Suze, two incredible people, full vibrancy and flair for life. Their wedding day was a true reflection of this, from the menu selection through to their choice of venue and entertainment. 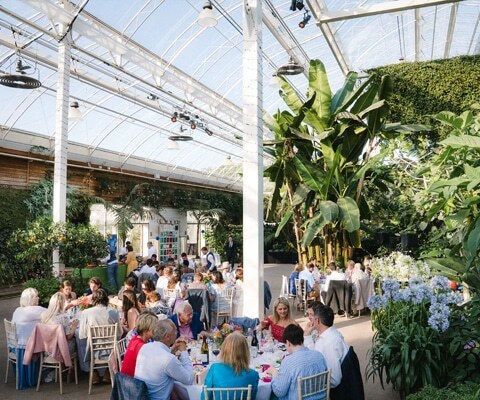 The Glasshouse at the Royal Horticultural Society Gardens is one of the most picturesque venues you’ll find within the M25, surrounded both internally and externally by diverse flora and fauna. 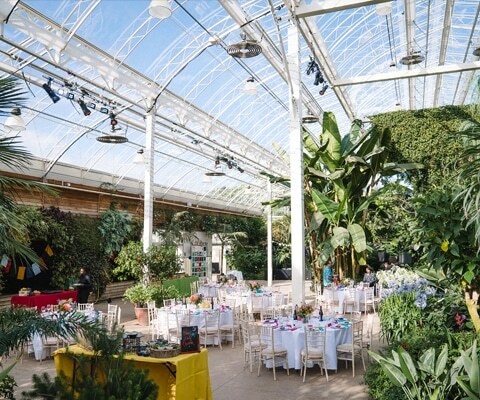 Many don’t realise that the venue is available for private hires, but Pat and Suze’s inquisitive nature when visiting the gardens for the day, led to them finding the perfect location for their wedding. 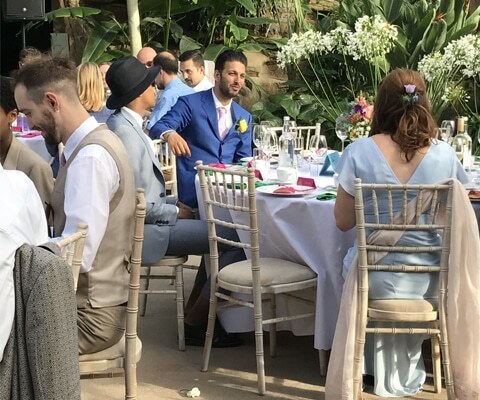 After watching Pat and Suze tie the knot under an old Willow tree, guests walked for 10 minutes through the beautiful gardens to the Glasshouse where the reception, meal and dance took place. 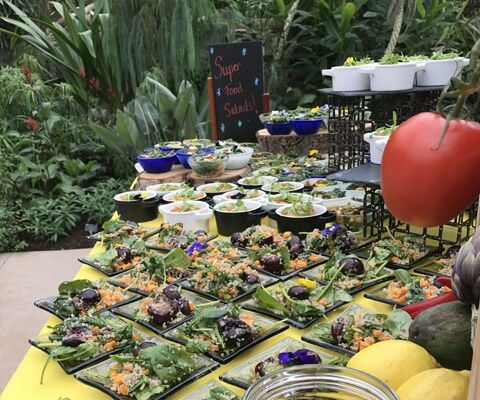 Where food is concerned, Pat and Suze have a passion for both sustainability and health, something they wanted to ensure was taken into account for their wedding menu. 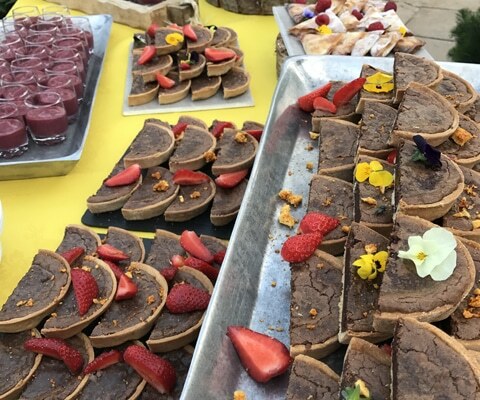 Conscious of catering to the tastes of all their guests as well as their own, they wanted to produce a menu that was colourful, nutritious, satisfying for large appetites, low in (but not free from) meat and dairy and of course delicious. Something we worked with them on from the very beginning, designing a bespoke food station menu that ticked all those boxes. 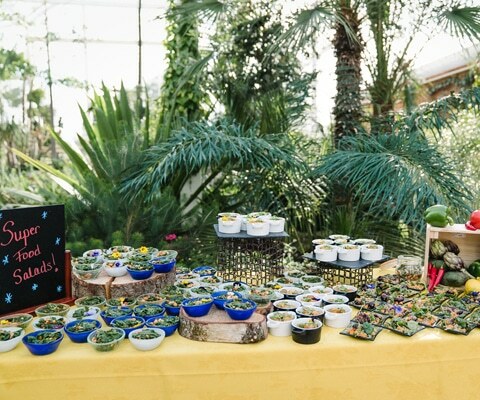 Food stations were chosen to encourage a dynamic and vibrant atmosphere and to allow those guests with larger appetites to refill multiple times. The stations were also a reflection of their passion for travel and international cuisine, drawing influence from multiple parts of the world as well as their own inherent approach to food. Our chefs were on hand to serve at each station, explaining what was on offer while the waiting team replenished the food. Following a 90 minute continuous service, where guests visited the stations as often as they wished, the Cuban band got the party started until last orders at 23:30. This was a really unique wedding, from the menu to the venue, everything was assembled perfectly by Pat and Suze resulting in a very special, custom-made occasion. 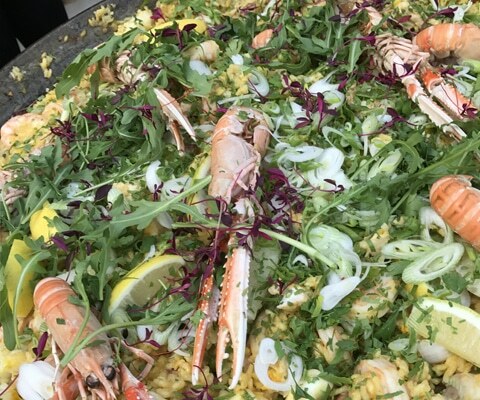 “It was such a positive experience working with Boulevard Events for our wedding catering. From start to finish, the whole process was totally easy, painless and enjoyable. 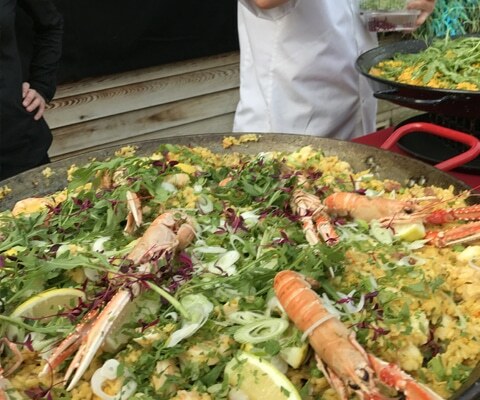 We knew that we wanted paella and a few other specific dishes. Mark and the team totally respected and encouraged our original ideas, and approached the whole thing with such creativity and enthusiasm. The end result was a variety of food stations, with the most incredible food which all our guests were so amazed at.